When we run a piece of T-SQL code, it can be dependent on another T-SQL code such as function. For example, stored procedure queries data with only one SELECT command. In this command you can use scalar functions in SELECT clause, table-valued functions or views in FROM clause, scalar functions in WHERE clause (that’s a very bad habit, but it’s possible), etc. Our T-SQL code can be affected by other database objects such as constraints and triggers. When we insert or update data, these objects can prevent to enter incorrect values, so our command would fail. Let’s look at how they would impact on database unit testing. I modify the test case I’ve created earlier in this post and add a simple constraint. My test passed because ClientName (‘John Smith’) consists of 10 chars. Now I change to something shorter, and the test failed. 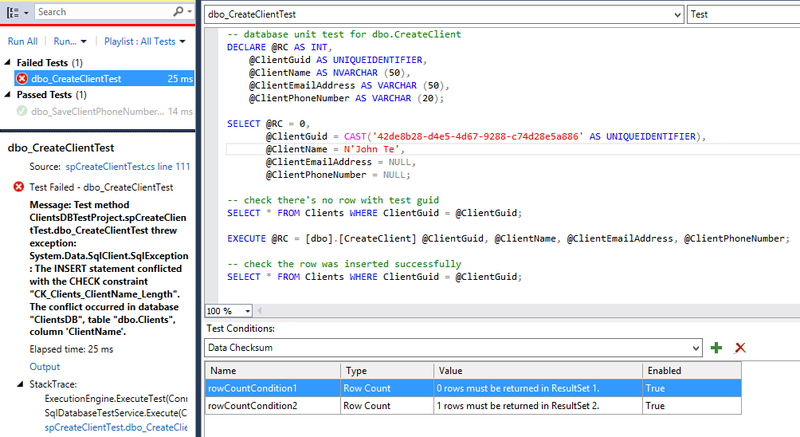 Write T-SQL code to disable the constraint. Now our test really passed. But don’t forget to enable constraint in Post-Test section of unit test.